Use our five star guide below to see which varifocals are best suited to your lifestyle and vision needs. Fit a larger range of frames than standard lenses. They have a wider field of clear vision at distance and intermediate than standard lenses and are easier to adapt to. Have a wide field of clear vision at distance, intermediate and near, with minimal soft focus, and are very easy to adapt to. Our highest quality lens. Latest technology gives excellent clarity and our widest field of clear vision at distance, intermediate and near. They are easiest to adapt to. Varifocals are lenses with no visible line that are used to correct distance vision, at arms length and close-up viewing. At Specsavers, we pride ourselves on our competitive prices. For varifocals we offer different categories of varifocals to suit any budget. How do I know which varifocals are right for me? Our experienced dispensing staff will be able to guide you in your choice and will base the recommendations on your lifestyle and usage of your glasses. Just ask in store for further details. Can I select any frame when choosing varifocals? Specially trained dispensing staff will be able to guide you on frame styles and sizes suitable for your preferred varifocal type. At Specsavers we have an extensive range of frames suitable for varifocal lenses, and if you opt for our Tailor-made range you can chose any frame style. I have heard that varifocals are difficult to get used to, is this true? People adapt to varifocals differently so one person's experience may be very different from someone else. 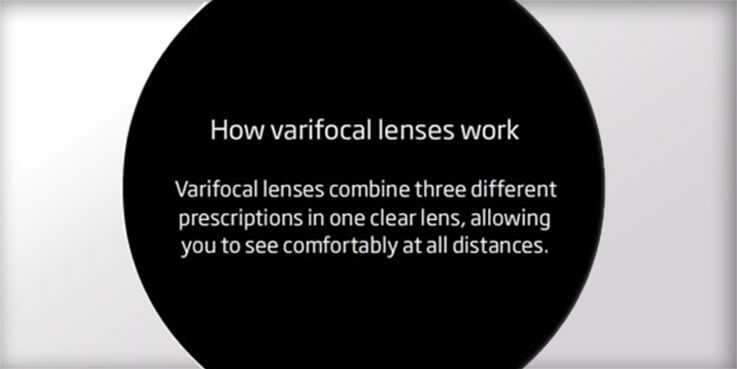 We will guide you in how to use your varifocals and to get the best from them, which in turn helps with the adaptation process. Also, we utilise the latest lens technologies to ensure that we offer the most up-to-date varifocal lenses - these are much easier to adapt to than some of the older designs from several years ago. It can take a short time to get used to varifocal lenses, so at Specsavers you can try a pair for 30 days with no obligation. If you can't get used to them, you can swap your varifocals for bifocals or two pairs of glasses - one for distance and one for reading - and we'll refund the difference in any price.